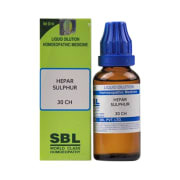 SBL Hepar Sulphur Dilution is prepared using Calcium sulphide in the specifications laid down by Hahnemann, the founder of homeopathy. It is an excellent medicine for those who are highly sensitive to everything. There is a tendency for forming abscess and discharging pus from any eruptions on the body. Can be given in large quantities to treat Pellagra, a nutritional deficiency caused by deficiency of vitamin B. It helps in cases when person feels extremely cold as if there is wind blowing. A licensed pharmacy from your nearest location will deliver SBL Hepar Sulphur Dilution 30 CH. Once the pharmacy accepts your order, the details of the pharmacy will be shared with you. Acceptance of your order is based on the validity of your prescription and the availability of this medicine.